Estate Adventures – Part 2 – Flawed, Cracked… But Rare! A good night’s sleep has revived me well enough to continue where I left off about the trip to jiju’s estate… not to mention it has filled my head with a few nightmares… the perfect ambience for the story that is about to unfold. I’d mentioned a dilapidated two-storied house in the estate… well, you might have to check yesterday’s post for it. Now, for all external appearances, the house looks intact… a little weathered but fine otherwise. The quartet of explorers (my cousins and me… yeah… there was an additional one who joined us later) decided to take a look in and maybe do a li’l Blair Witch Project number on it. The sun was quite high up in the sky… just after mid-day. The tropical heat was not being very nice to us (especially to me… am not used to the humidity) and the uneven trek had pretty much tired us all out. When we finally reached it we saw that there might actually be a li’l truth in the stories my sis and jiju plied us with about the house being haunted. It did look the type. There was this huge pile of coconuts piled up in its verandah… a Shangri-La for big tarantula-esque spiders and scorpions and the occasional snake. And the place reeked of dried cow-dung… the reason was that there was a huge pile of it nearby baking in the sun… ready to be used as manure. The house had a 4 feet wide verandah all around it… and the eaves of the first floor roof were hanging so low that you had to bend to get up the steps to the verandah… and am not exactly ramp-model-tall. The doorway had the old-fashioned 4 split-paneled door (4 panels that can be opened separately)… the panels hung on rusty hinges and were covered with cobwebs… but the door was open. We entered the house and saw that there was a corridor that ran three-quarters around a central walled room… maybe the fourth quarter had a bathroom…we didn’t check! The central room was our focus… as we figured out the staircase to the upper floor would have to be inside it. The idea was to get to the top of it… hmmm… we did place a lot of trust in old workmanship. With the door open, the corridor was pretty well lit but it was quite a shock to enter the central room… it was pitch dark inside… even with its door open. We couldn’t see our hands held in front of us. This wasn’t turning out to be as cool as expected… and we all had smart-phones with us…which meant none of them had a torch light like a cheap Nokia would. Someone, not me… my phone didn’t have a flash, used the flash to light up the inside. The momentary flashes created bizarre images on the wall… moving shadows that seared our eyelids… making it difficult to re-adjust the eyesight in the dark. None of us wanted to keep the flash on for long ‘coz that would drain our smart-batteries and the return trip would take long… everyone, except me… my phone didn’t have a flash! Finally, we did manage to get some light… thanks to my smoking cousin (naah… not smoking hot… just that he smokes)… and his matchbox. The flames never did last long… the room seemed filled with very old air… it was reeking of guano. And then we saw why… the rafters seemed alive… and breathing… and writhing… with hundreds of bats (and may I say, unhappy bats… considering we had just stomped in on their beauty siesta). In the flickering flame we also found the staircase… narrow and crumbling… wood that looked rotten, but surprisingly strong… at least, the first rung was. Didn’t check the other rungs… the first rung got me quite close to an upset bat and I didn’t fancy it snapping at my nose or the tetanus shots and anti-rabies shots that would have to follow. The floor was littered with bat droppings and am sure would be over-run with rats at night… we could hear the rat squeaks already. We decided we should leave the place before we were subject to a two-pronged attack by the Rodentian& Chiropteran Orders! My cousin clicked a few rapid pictures in quite a haphazard manner… his contribution to our version of the Blair Witch Project… disturbing the inhabitants of the room quite a bit. He even claimed to have clicked a yakshi (a female ghost) … which when we later checked out in the open turned out to be just me! With the bats agitated and seeking to fly out… we were even more motivated to make our own escape. 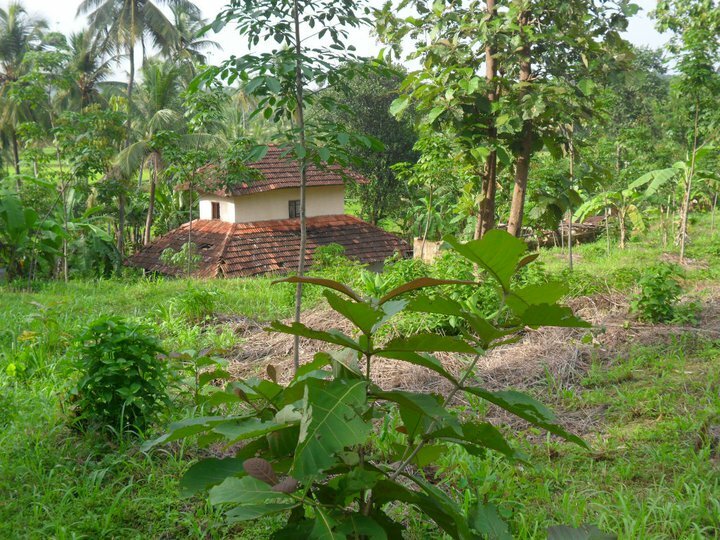 We scrambled out of the room, tripping over coconuts and bumping our heads on the low roof… and managed to get out in the open air… back to the divine smell of cow-dung (as opposed to the not so divine smell of guano). We were hungry and dead tired and the trek back to the overseer’s bungalow was a long one… this time we did follow jiju’s instructions and did not wander off the path. Back in the bungalow we had tall glasses of chilled lemonade and large helpings of steamed kappa (tapioca)… spiced with tempering (mustard, dry red chili & curry leaf tadka with grated coconut) for me and with fish curry for the rest of the gang. This was followed by a passion-fruit pudding made by the overseer’s wife. Full tummies meant that we were all sleepy and that was not good considering a few of us had to take turns driving back home. So, we decided on another trek in the opposite direction of our earlier route. This one was not meant to take long… it was within the boundaries of the first plantation. We walked along the paths among the rubber trees and recorded videos of the workers ‘skirting’ the trees in blue tarpaulin… the trees looked funny with their blue skirts, like tall ballerinas in really short tutus! We had directions from jiju to a well in the estate… he wouldn’t divulge much but just asked us to be careful. We sensed the well before we saw it… no… it wasn’t smelly or anything like that… just that a portion of the landscape looked as if it had caved in at a spot… like something had been pulled through a wormhole. 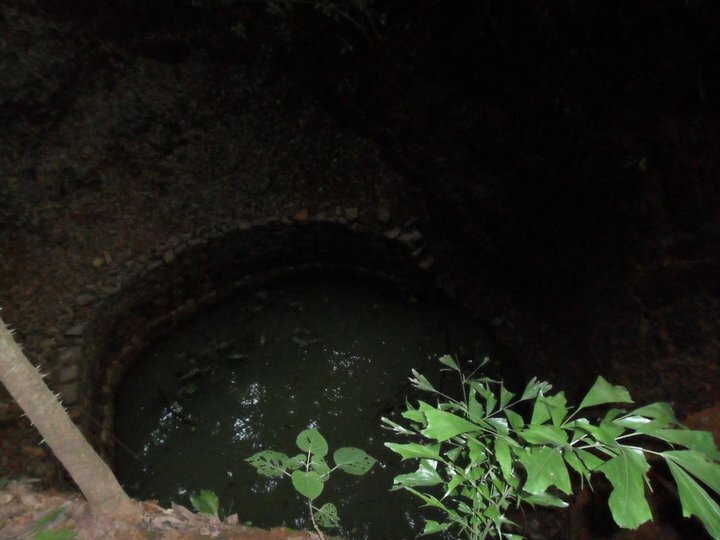 We reached what I call the Andha Kua… a huge well (photographs do not do it justice)… deep almost fathomless… and dark. The well had no raised walls… it started at ground level and just plunged in to the bowels of the earth. There was a bucket tied to a rope that coiled almost a foot high… there was no pulley… the bucket had to be raised and lowered manually. I tried to do it and the bucket just slipped… clanked its way down to the water taking the coil of rope with it… someone had the sense to stop it from uncoiling completely. In my defense, I wasn’t expecting the bucket to be that heavy! There were metal rungs embedded in the stone wall of the well, for people to climb down to the water level… which in spite of challenges and prodding I wasn’t foolish enough to accept. But, I wanted pics and from our vantage spot at the top, none were coming out nice… that is when a worker came up to us to warn us about not slipping in and it should suffice to say that he did slip in (figuratively, of course). We said we were trying to get pics and were planning to climb down the metal rungs… he gave us a glowering look, mumbled something (am sure they were some wonderful local expletives), took my cousin’s cell-phone, tightened his lungi and clambered down the rungs himself… and took this pic… not bad, I say! He clambered up just as soon and slammed the phone back in my cousin’s palm and asked us to get our asses out of there. We thanked him profusely and decided not to linger and irk the poor guy more. Soon, we were back in the bungalow… in time for tea and snacks… banana fritters and pani-kam chai! Yummy! Lol! Flattery wont get you anywhere! why cannot i write like u. copying ur style is not working, may be i need to copy the entire post from now on.